We embarked on this journey to help our late grandmother cope with her vision loss. After many rounds of prototyping, testing and learning our proof of concept is ready. Now, we need your help to get BAWA Cane into production for the world. Today, we’re not just launching a product, we’re launching a revolution! We are proud to announce that BAWA Cane is LIVE on Indiegogo. 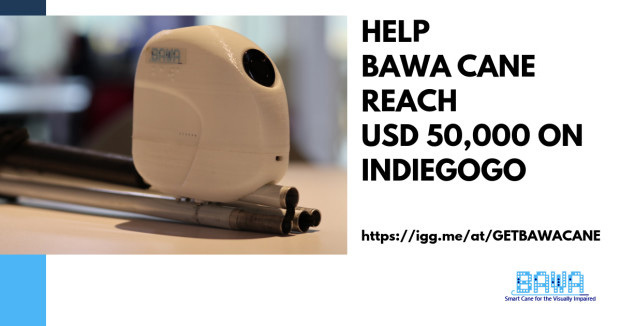 Get BAWA Cane on Indiegogo and save up to 44% off retail price now! You are not just pre-ordering a product: You’re helping to build BAWA Cane and go into production. Through this revolution, you are empowering millions with technologies that may change their mobility and access to get to what they want to achieve – to work, to participate, to socialize. Our goal is to get BAWA cane into as many blind and visually impaired hands as possible across the globe. And we believe BAWA Cane can help us achieve our mission to revolutionize the way visually impaired could better perceive their environment. To start up the production, we would like to invite you to back our Indiegogo project and get your own BAWA Cane, or for your loved ones, or surprise someone with the gift of BAWA Cane. We have set a goal of USD 50,000 for this campaign within 40 days. We would be utterly thrilled to be able to have your support and create positive change in disrupting the global assistive technology for the visual disability sector. Let’s work together to revolutionize and impact the lives of blind and visually impaired in their pursuit of mobility, safety, and independence. We value all forms of help to get BAWA Cane to full impact. Hit one of the buttons below and tag a friend, family member or co-worker who need this! Till next time, the BAWA Cane Team. If you haven’t read our startup journey, click here. Read about our 13th WIEF achievement here.